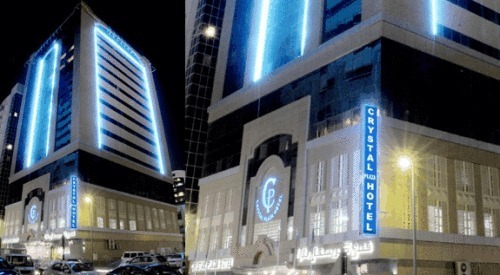 Crystal Plaza Hotel Sharjah, Hotel United Arab Emirates. Limited Time Offer! Crystal Plaza Hotel. The 3-star "Crystal Plaza Hotel" is an excellent place to stay when visiting Charjah. Just step outside and you will find yourself downtown. The interior decoration of the accommodation can best be characterised as simple. There are 168 rooms to choose from. Every room has been described as being large. You can dine at the onsite restaurant which is known for its international specialty. Of course, Internet access is offered at no extra charge. Located in the heart of Sharjah, the brand new Crystal Plaza Hotel is conveniently located for many of the city’s top attractions including the Gold Souk, the Heritage Centre and Mega Mall.